For the last of the spring crop of garden peas (snow peas almost ready though), I trolled my cookbook collection and Internet foodie sites for a special send-off recipe. I was intrigued by the many variations of Creamed Peas and Potatoes, an old-fashioned treatment for these spring beauties. Fresh peas are such a delightfully sweet and non-starchy version of those dark green, wrinkly frozen peas we must make do with out of season and deserve to shine when they are on our supper menu. For most nights, we eat our spring peas simply, as Polish Peas but this new recipe, adapted from Cooks.com, is one that we will make again. In a medium saucepan cook potatoes in a small amount of boiling salted water for 10 minutes, or until tender. Add peas and cook 3-4minutes more or until tender. Drain. In a medium saucepan cook onion in butter until tender but not brown, about 10 minutes. Stir in flour, salt and pepper. Add milk all at once. Cook and stir until thick and bubbly. Cook and stir 1 minute more. 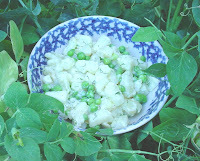 Stir in potatoes, peas, mint and dill. Lol! Can a dish be retro if my dad still eats it every spring and summer? He loves his creamed potatoes with peas and carrots - fresh herbs would help!